We can all recognise the stereotype of the witch - an ugly old hag with a long, hooked nose, warts on her face and an evil glint in her eye. It is something us modern witches are constantly having to fight against, but it is annoyingly prevalent in popular culture. 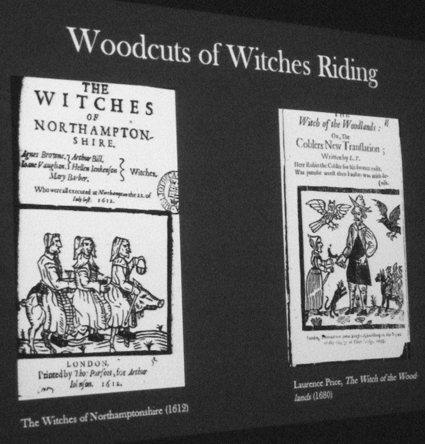 At the London Metropolitan Archives on Tuesday, historian Jasmine Losasso gave a talk about ways witches appeared in 17th century pamphlets and woodcuts and how that has influenced portrayals of witches right up to the present day. The talk was entitled "Neighbours in her look malicious signs did see", which is taken from a broadside ballad of 1619, The Damnable Practices of 3 Lincolnshire Witches. The ballad is about Joane (or Joan) Flower and her two daughters, who were executed for witchcraft. The quote emphasises the point that, in folk beliefs, witches looked malicious and you could probably identify them just by their demeanour. Jasmine illustrated her talk with slides showing numerous pamphlets and pictures from that era, nearly all of which showed witches as looking old, ugly and often somewhat deformed. This depiction of them has even influenced some modern historians to assume that most of those accused of witchcraft in the 16th and 17th centuries were old women. However, it isn't true. Jasmine's research has shown that although more women than men were tried for witchcraft, there was quite a wide range in their ages. Some were old, but many were young or in their middling years. 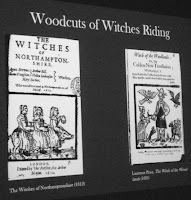 Jasmine's talk offered an original angle on the historic witch trials - and also useful evidence to quote the next time someone comes up with the claim that historic victims of witch hunts were predominantly crones.